Working room by room, the owner has freed the post-and-beam house of linoleum and plywood updates from previous owners. New windows flood Donna Hochberg’s 1790 home in North Reading with light as she relaxes with a friend. A succession of owners had undertaken unsympathetic renovations and additions, so restoring the house’s integrity was an ambitious project. Hochberg worked room by room, guided by Mat Cummings, an Ipswich-based architect specializing in historical renovations. In 2014, after two major renovations, it came time to tackle the kitchen. The room had 1950s linoleum floors, plywood cabinets, and a dropped ceiling but no windows, and the appliances were older than Hochberg. “They essentially just stopped working,” she recalls. “I wanted the kitchen to have light and windows and the look and feel of a room that would be in a higher-end home in the late 18th, early 19th century,” she says. It also had to be functional, so modern appliances were a must. Before drafting plans, Cummings did exploratory work within the walls and ceilings surrounding the kitchen. “We needed to understand the whole house and how it used to work so we could bring it back to life,” he explains. Enter the master bedroom through the bath? Why not. A Norwell couple detours from tradition with their master suite renovation. Much to Hochberg’s surprise, Cummings discovered that the dropped ceiling and additions to and around the kitchen concealed the structure of a timber-frame barn. Cummings called for the timbers to be exposed and turned that part of the kitchen into a seating area. A modest bump-out enlarged the kitchen and allowed for the addition of windows, a skylight, and a door to the backyard. 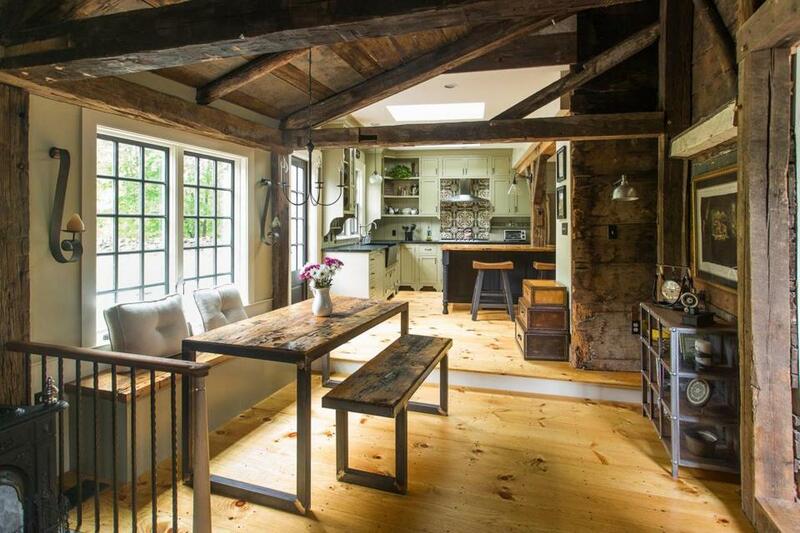 Original timbers, including a beam that runs through the center of the kitchen, are paired with salvaged pieces, such as a support post that goes directly into the island. 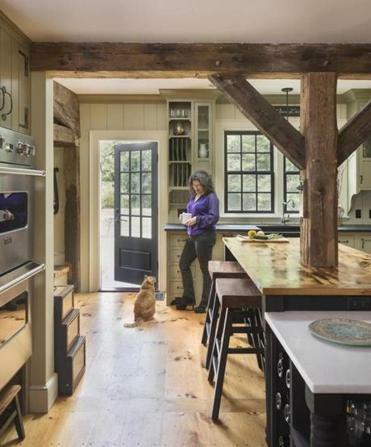 An unexpected discovery by architect Mat Cummings — the hidden structure of a timber-frame barn — helped dictate the design of Donna Hochberg’s kitchen. Matt Diana Housewright, a Georgetown contractor, fabricated the custom cabinetry using hand tools that would have been contemporary two centuries ago. Cummings says: “Cabinets are integrated into the architecture of the space. They match the trim colors the way you would have seen it done 200 years ago.” Cast-iron hardware is both relevant to the era and cutting-edge — the material has made a recent comeback. Hochberg referred to Benjamin Moore’s Historical Colors collection to select period-appropriate paint hues. “An artist friend told me what colors I couldn’t use,” says Hochberg, who ultimately selected Hancock Gray for the cabinets. For additional historical context, black milk paint, popular in the Colonial era, was used on the island. Milk acts as a binder for pigments the same way polymers and oils do in latex and oil paints. While working with milk paint is laborious, its saturated colors and translucent finish give textured surfaces a lovely antique look. Topped with reclaimed wood, the island is simpler than standard modern pieces; legs add a furniture-like appeal. A lower tier with a marble counter serves as a baking station. Floors are native Eastern white pine; the nailheads binding the boards are exposed as they would have been when the house was built. “The floor now has a yellowish color, but it will eventually have a rich orangey patina,” says Cummings. The same simple pine boards were used for the backsplash, where hand-painted tiles behind the stove add subtle artistic flair.